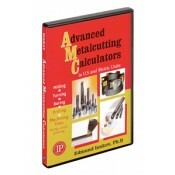 Advanced Metalcutting Calculators contains four calculators for major metalcutting operations: Milling, Turning, Boring, Drilling; and a fifth for calculating exact Machining Time when facing, cutting off, and deep grooving. All calculators are developed in Microsoft Excel and execute all parameters in both U.S. and metric units. These calculators provide computations more accurate than any other calculators on the market and can be used by anyone involved in manufacturing, including machinists, technicians, and engineers. Power requirements when milling, turning, boring, or drilling are calculated by tangential force and cutting speed, or by torque and the number of revolutions per minute. These requirements are calculated when cutting inserts are sharp and prior to indexing or changing them. • Cutting force versus ultimate tensile strength of the work material and area of the chip. • Torque at spindle versus cutting force and the cutter diameter. • Cutting force components – tangential force versus depth of cut, feed rate, and the work material’s power constant; feed and radial forces versus tangential force and the coefficients of proportionality, depending on the group of work materials. • Tangential force versus drill diameter, feed rate, power constant of the work material, and the drill wear factor. • Thrust (axial force) versus tangential force and the coefficient of proportionality establishing thrust-to-tangential force ratio. • Torque at the drill versus tangential force and the drill diameter. • Radius of the workpiece when the machine tool spindle runs at the maximum rpm. • Machining time (in minutes) when facing or cutting off to the center of the workpiece; or when deep grooving, facing, or cutting off to a shoulder of the workpiece.